Simple invitation remarks, when written inside a detailed and carefully crafted invitation, can make someone look forward to your special event. Create custom invitations that bring excitement! Turn to Chic Creations in Bergen County, NJ for creative and innovative invitations. When talking about invitations, presentation is the key! Your heartfelt invitation message may make your guests remember your important event; but by placing it inside a beautifully designed invitation, your invitation will move them to mark their calendars in an instant. Get special invitations from Chic Creations. Start making your custom invitations by choosing the ideal type and dimension of your card. 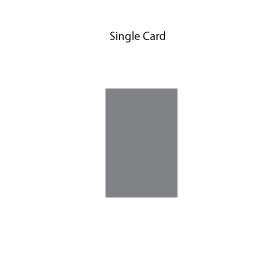 There are a variety of sizes and paper to choose from for a basic single card invitation. Some standard sizes that are available: 3 x 5, 4 x 5, 5 x 7, 4 x 9, 6 x 6, 7 x 7, and 6 x 9. You can print on 14 point gloss or dull coated cover paper as well as an array of matte and metallic colors. Your invitation can be a single card, not mounted, or an invitation with multiple layers to create a custom design. The pocket card is a unique way to bundle your invitation and other printed items, such as direction sheets and reception and response cards into one package. There are 2 sizes available: 5 x 7 (landscape or portrait) and a 6 x 6 square. You have the choice of an angle cut (straight edge) or a bracket cut (scalloped edge). 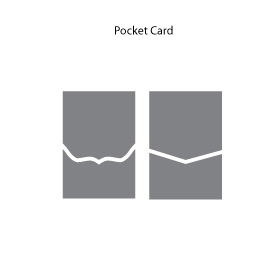 The pocket card allows you the flexibility to either insert your invitation into the pocket or mount the invitation to the reverse side of the pocket. This style comes in a variety of matte, metallic, and patterned paper for every style. 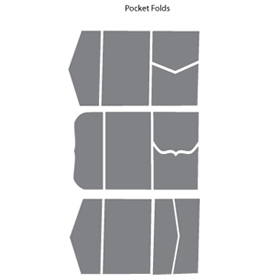 The pocket fold is another unique option to bundle your invitation and other printed items. It is typical to mount your invitation to the inside area of the pocket fold and insert the other printed items into the pocket. There are more sizes available in this style: 4 x 5, 5 x 7 (landscape or portrait), 6 x 6 square, 4 x 9, 7 x 7 square, and 6 x 9 (landscape only). With this style, you also have the choice of an angle cut (straight edge) or a bracket cut (scalloped edge). This style comes in a variety of matte, metallic, and patterned paper for every style. 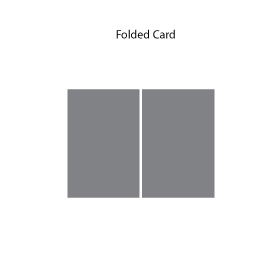 The folded card is similar to the pocket fold but without the pocket. You have the option of printing directly on the folded card itself or you can mount your invitation to the inside of the folded card. 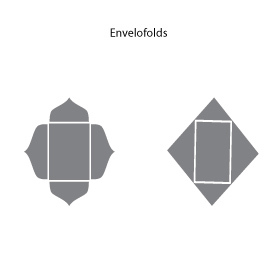 The standard sizes (when folded) available are: 3 1/2 x 5, 4 x 5, 5 x 7, and 4 x 9 (landscape or portrait), 6 x 6 square, 7 x7 square, 5 1/2 x 8 1/2, 4 1/4 x 9 (landscape). This style comes in a variety of matte, metallic, and patterned paper for every style. 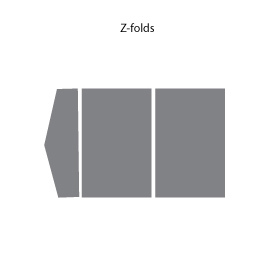 This is a tri-folded card. You have the option of printing directly on the folded card itself or you can mount your invitation to the inside of the folded card. The standard sizes (when folded) available are: 4 x 5 or 5 x 7 (landscape or portrait), 6 x 6 square, 7 x 7 square, 4 x 9, and 6 x 9 (landscape). This style comes in a variety of matte, metallic, and patterned paper for every style. This style is a beautiful way to hold your invitation. You can mount your invitation to the inside of the Envelofold or insert the invitation into the Envelofold. There are 2 sizes available: 5 x 7 and a 6 x 6 square. You have the choice of an angle cut (straight edge) or a bracket cut (scalloped edge). This style comes in a variety of matte, metallic, and patterned paper for every style. All of the above styles can be embellished with rhinestones, brooches, and ribbons. Be it a birthday party, anniversary celebration, or bridal shower invitations you require, Chic Creations always delivers. Make celebrations grander with stunning and exquisitely crafted cards. Our masterpieces fall nothing short of perfection. For more information about our invitation company, do not hesitate to give us a call. Choosing the right style and size of invitation is the first step in making the perfect invitation. If you have already found the invitation type and dimension that suits your liking, let us know so we can proceed to draft your invitations’ design. Call us today to schedule a consultation today! You may also reach us for inquiries about any of our products.